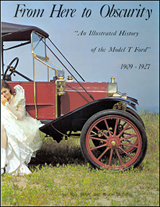 From Here to Obscurity: An Illustrated History of the Model T Ford 1909-1927.”This hardback volume is the authoritative Model T history. Inside, you’ll see a year-by-year breakdown of the changes in the cars & trucks. This large book presents the history of the Model T in a stunning array of nearly 1,000 photographs of the Model T, with illustrations, diagrams, serial numbers, production figures, specifications and more taken from original Ford sources. You will find every production Model T featured in this book–even the Fords before the T, models N, R, and S. There’s also a section on popular parts — an illustrated review of headlights, transmission covers, and carburetors. 195 pages with over 1,000 photos. Hardbound with full-color dust jacket. Authored by Ray Miller. A must-have book for the T owner.